These snowy white, crazy yummy cookies are so quick and easy to bake up, they’ll amaze you with every bite! This recipe is for the nistisima (or vegan) version of kourambiedes, slightly different but just as authentic as the more well known butter cookie version. Made with a combination of almond meal and flour, orange juice and a bit of brandy, the finished cookies are light and high and just ever so slightly crumbly. Kourambiedes are a cup of coffee ad tea’s best friend! This recipe makes about 2 dozen cookies and can easily be doubled or tripled as your occasion dictates. Go ahead and make the dough up to a week ahead, just bring to room temperature before baking! In a small glass, combine orange juice and brandy (and vanilla extract, if using) and mix them into dry ingredients until everything is completely incorporated and mixture is crumbly. Add vegetable oil (or very light olive oil) and knead into crumbly dough to combine completely. This will form a ball of dough. Pinch of golfball size pieces of dough and roll into circles. 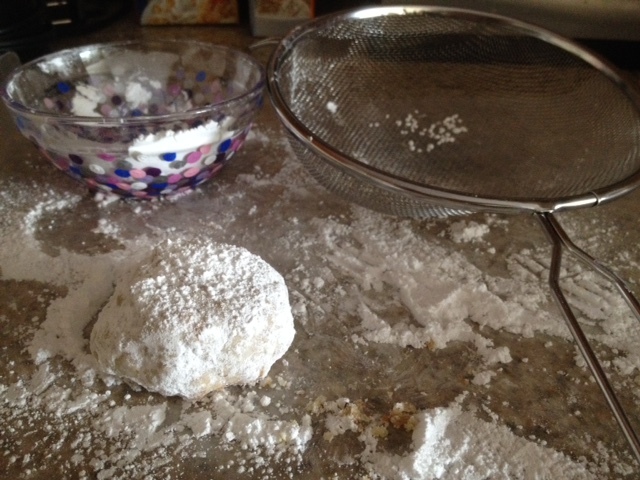 Place on ungreased cookie sheet and press down just slightly so balls of dough don’t roll off the pan! Bake at 350 degrees for 22-24 minutes until bottom of cookies is golden brown. Keep an eye on them because its difficult to tell from the tops when the cookies are done. Order your PRINT 2016 Calendar Cookbook now! 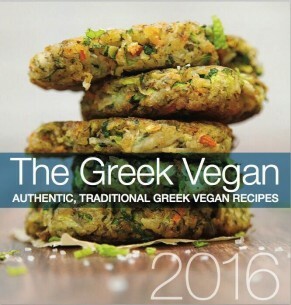 Just $9.95 for your monthly calendar of 12 of the most popular recipes on The Greek Vegan in 25 gorgeous, glossy pages with an easel back stand to display anywhere – it’s a must have and a fantastic holiday gift 🙂 Order your 2016 Calendar Cookbook – Just $9.95! Can we just use all purpose flour if we don’t have the almond meal? Georgia, I honestly can’t say as I’ve never tried it and don’t want to steer you wrong. I’m pretty sure that you could switch them out but I would have no idea how to calculate that substitution. If you do try using AP instead of almond flour, please let us know how it goes! 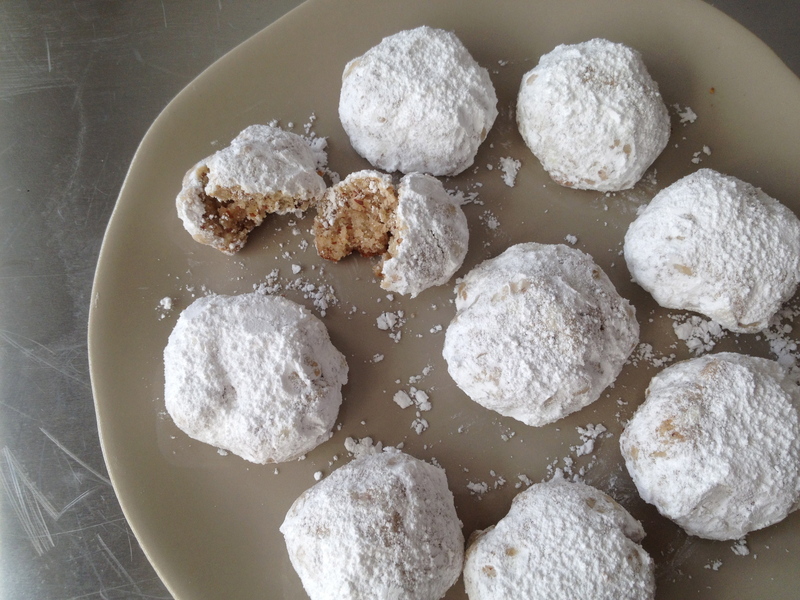 I made them only with ap flour and let’s just say I was the only one who ate them! Lol I just made them with exactly your recipe to a tee and they were better! They’re not like kourambiedes I’ve had before though but I still like them. Thx! Hi! 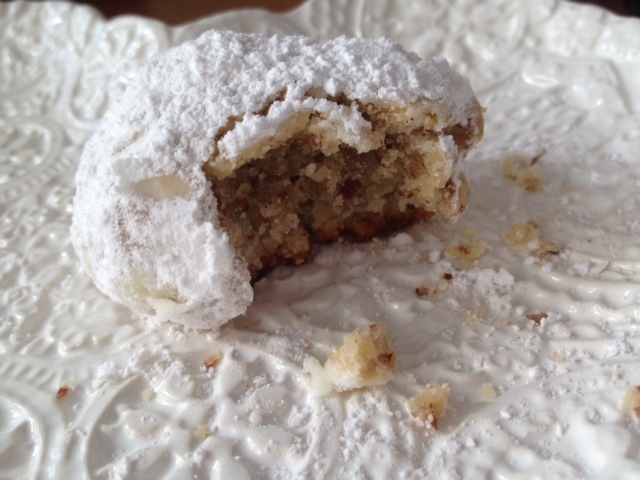 Could these be made with gluten free all-purpose flour and then the rest of your ingredients? Any changes or additions needed? Thanks. I’m in Australia, I’m assuming what you call “AP” or All Purpose flour is what we call, not very imaginatively I must say (!) “plain flour” ?? Also I managed to find, with some difficulty, the “almond meal”, it was relatively expensive (i.e. it works out around $A30.00 per kg/ approx $US9.80 per lb), could you substitute with blanched/ peeled raw almonds pulverised with a pestle & mortar ? Thank you Kiki, I’m making my first batch tonight (with the almond meal as mentioned, and “plain” flour! ), if they’re a success I’ll make future batches with the raw almonds, I found myself a supplier and they’re MUCH cheaper, and, as you say, very easy to ‘do-it-yourself’ !